I used to be extremely critical of Facebook Ads in the past. But that’s before Facebook released a boatload of functionality for enhancing your campaigns. Sure, marketplace ads, or ads running the right sidebar, have seen declining engagement over the years, but that’s just a fraction of what you can do now with Facebook Ads. And I’m finding many advertisers don’t know about the powerful options available to them. For example, there’s FBX (or retargeting on Facebook), news feed targeting, mobile-only targeting, promoted posts, custom audiences, lookalike audiences, unpublished posts, etc. And with this enhanced functionality comes better targeting and performance. Now, I still think paid search can reach someone who is searching for a specific solution at the exact time they need it, and social advertising can’t do that (yet). But, using advanced targeting within Facebook can absolutely make an impact, and on multiple levels. In this post, I’m going to explain one method of using three pieces of functionality in Facebook Ads that might change your view of social advertising. It has for me, and I’ve been using this technique for some time now. It leverages unpublished posts, custom audiences, and lookalike audiences to target your current customers, and users similar to your customers, when you are running a specific promotion or sale. It’s a great way to make the most of your current assets, and at a relatively low cost. I find many business owners have no idea what unpublished posts are. If you fit into this category, then today is your lucky day. Unpublished posts enable page owners to create page updates that don’t get shared with their entire fan base. In addition, you can run ads based on the unpublished posts and use a wealth of ad targeting to reach the right audience (which can include current customers). Interesting, right? The easiest way to create an unpublished post is to use Power Editor. And if you’re running Facebook Ads and not using Power Editor, you should start today. 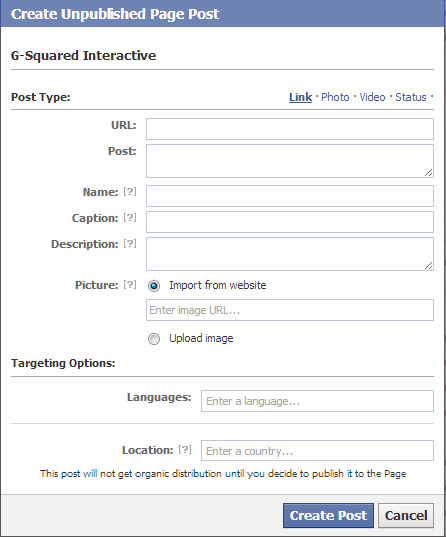 It offers a lot of functionality and targeting options not available in Ads Manager (which is what advertisers use on Facebook’s website). By clicking “Manage Pages” in Power Editor, you can actually craft a page post. But since we want an unpublished post, you can create the update and not publish it. That’s ultra-important, since we want to use the post as an ad, and not an update that’s broadcast to your entire fan base. So, if you’re an ecommerce provider running a specific sale, you could create an update focusing on that sale, with an understanding it will reach a very specific audience (and not every fan). I’ll cover how to target specific parts of your customer list soon, including people that are similar to those users. Once you create your post, you can click your account ID in the left pane to return to your ads dashboard (in Power Editor). Now we’re ready to talk about custom audiences and lookalikes. 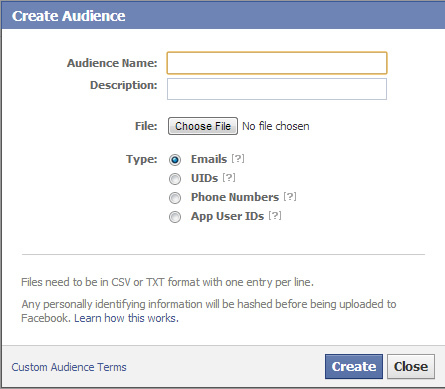 I wrote a post earlier in the year about custom audiences in Facebook. You should read that post to learn how to set them up. You’ll need a custom audience in order to use the method I’m covering in this post (since that’s the audience you will target, and it’s also the list you will use to create a lookalike audience). Custom audiences enable you to upload a list of current customers, based on your in-house email list. Then, Facebook will match up the list with users on the social network. Yes, you read that correctly. 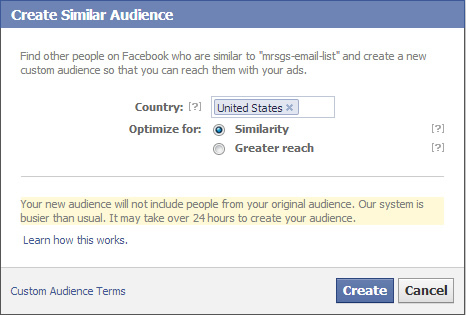 That means you can target your in-house email list (or parts of that list) via Facebook Ads. Awesome, right? Once your custom audience is created, you can use that list to target current customers with specific promotions and sales. And you can use unpublished posts to reach them. Did you catch that? I said unpublished posts. That means getting your targeted promotion in front of your current customers (whether they are fans of your page or not). Great, but what’s a lookalike? Lookalike audiences enable you to base a new audience (set of Facebook users) on a custom audience (your current customers). Facebook reviews a number of characteristics about your custom audience (your current customer base), and then finds people similar to your customers. Yes, once again, eye-opening targeting opportunity ahead. Once you have set up a custom audience (following my tutorial), then you can easily select that audience in Power Editor, and choose “Create Similar Audience”. Choose “Similarity” in the dialog box and Facebook will find users that are similar to your in-house list (based on a number of criteria). It could take up to 24 hours to create the list, but I’ve seen it take much less time than that (especially for smaller lists). OK, we have covered unpublished posts that contain targeted messages about new promotions or sales. We have also covered custom audiences based on our in-house email list. And, we have covered lookalike audiences, which enable us to target similar people to our own customers. Now we are ready to tie them together. 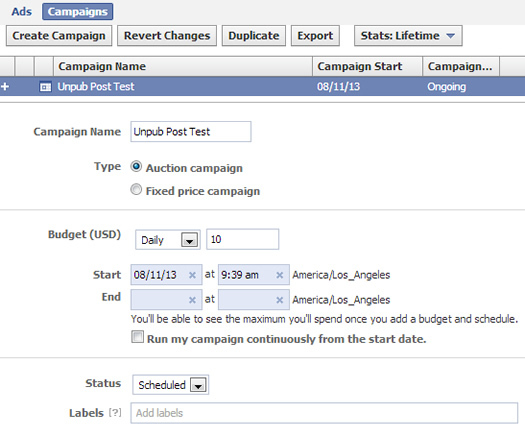 In Power Editor, you can create a new campaign and set the campaign parameters like name, budget, etc. Click the “Ads” tab to create your ad. 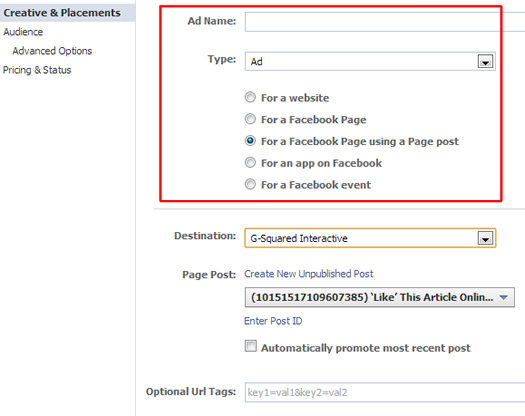 Under “Type”, choose “Ad”, and then select the radio button labeled “For a Facebook Page Using a Page Post”. 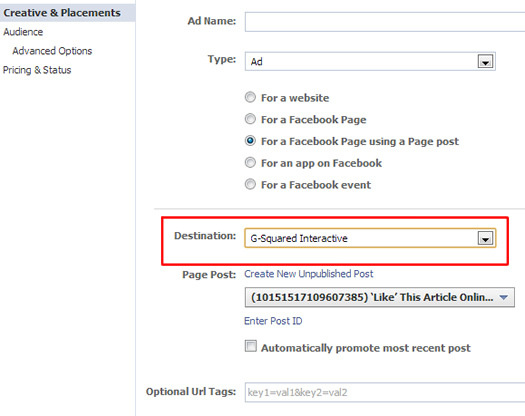 That will enable you to choose an unpublished post for your ad. For “Destination”, choose your Facebook Page. Note, your page’s image and title will still link users to your page, but the post itself can drive users to the sale landing page on your website. Your post itself is where you should place the link to your landing page (on your own site). In addition, you should add tracking parameters to your destination urls for your unpublished post (so you can track each campaign via your analytics package). Now, choose your unpublished post to use that post as the actual ad. Note, you can also create your unpublished post at this stage (using Power Editor). That’s a nice feature that was recently added. OK, how awesome is this? You get to choose where your unpublished post shows up. For example, in the News Feed (Desktop and Mobile). This is the most powerful placement in my opinion. Your ads will show up directly in someone’s news feed versus along the right side. 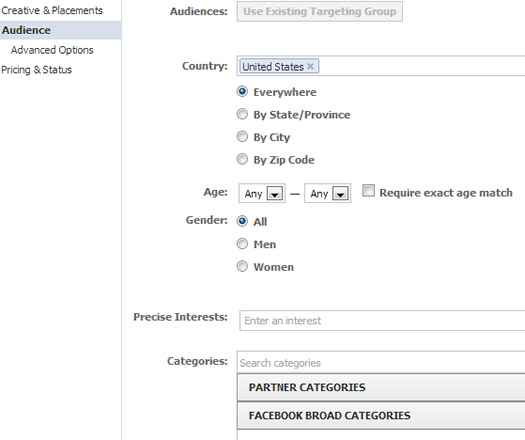 Under “Audience”, you can choose targeting, based on the goals of your campaign. Note, this is not where you will choose your custom or lookalike audience, although the tab is titled “Audience”. You can choose location, age, gender, etc. if you want more granular targeting than just the custom audiences we created earlier. 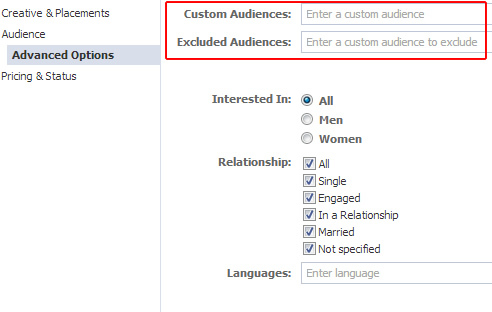 Under “Advanced Options”, you’ll notice the first field is titled “Custom Audiences”. If you start typing in that field, your custom audience should show up (based on what you named the audience when you created it). Once selected, it should show up in the field. You can leave the rest of the targeting options located below as-is. To clarify what we’ve been doing, this ad will target your current customer list. When you create a second campaign, you can choose your lookalike audience. Then you can run both campaigns and target both your current customer list and people similar to your current customers. 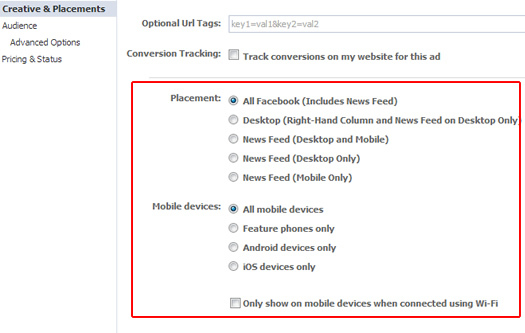 And since they are in separate campaigns, with separate tracking parameters, you can track performance by audience. Awesome. For this example, let’s choose CPC and enter the desired cost per click. Facebook will provide a suggested CPC to the right. Once completed, you’re ready to rock. 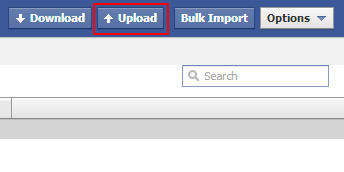 Click “Upload” in Power Editor and your ad will be uploaded to Facebook, where it will need to be approved. Once approved, you’ll receive a notification that your unpublished post is live. By using this approach, you can get your latest sale or promotion in front of your current customers as they browse Facebook, while also providing a great opportunity for that sale or promotion to get shared. For example a current customer might like your update, and it could hit their friends’ news feeds, which can provide even more exposure and opportunities to land new customers. Even though the unpublished post is technically an ad, it still looks and works like a typical page post update. That means users can like, share, and comment on the post. And yes, users often do like and comment on unpublished post ads. Remember, the unpublished post ad is hitting users’ news feeds (both desktop and mobile), so there is a strong chance they will be exposed to your ad. And if it’s crafted well, then there’s a chance that a certain percentage of that audience will engage with the post. It’s a great way to engage your current customers, while also engaging similar people (via a lookalike audience). Gaining more page likes is an added benefit to using this approach. Sure, you want people to click through to your sale landing page and buy, but you probably also want more page likes (so you can reach more people with your organic status updates down the line). 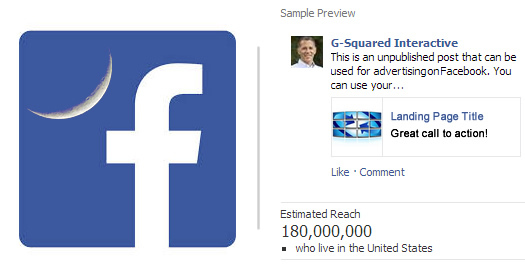 I’ve seen unpublished post ads work extremely well for gaining more page likes (across industries). For example, a recent campaign I launched increased page likes by 7% during a one week period. Not bad, when you take into account the other benefits from running the campaign (like exposure, sharing, engagement, and sales – which I’ll cover next). Using this approach can yield a low CPA, high ROAS method for increasing sales for specific promotions. I’ve run campaigns where the CPC was under $0.40 per click, and depending on the specific campaign, return on ad spend (ROAS) can be extremely strong. For example, 2000 clicks at $0.40 per click is $800. A conversion rate of 2.0% and an average order value of $75 would yield $3000 in revenue and 275% ROAS. That’s just a small and quick example, but unpublished page post ads could yield a shot in the arm pretty quickly. And from a B2B standpoint, with average order values typically much higher than B2C, the ROAS could be even greater. Even a handful of sales could generated thousands (or tens of thousands) of dollars in revenue. For example, a recent campaign I launched for a client focused on items starting at $1000 (and some were up to $5000 per item). Even one sale at $5K based on the campaign I mentioned before would yield a strong ROAS. And let’s not forget other important micro-conversions on your website. For example, newsletter signups, which can be a great driver of revenue for any ecommerce provider, app downloads, requests for more information, etc. all fall under this category and can start forging a relationship between prospective customers and your business. OK, I love using this approach, but social advertising brings some unique challenges with it. Since what we’ve covered is an actual page post, and not a straight ad, users can interact with it. That means both positive and negative interaction can occur. For example, you might have some unhappy customers post their negative feedback in the unpublished page post ad. How you deal with that situation is for another post, but I always recommend addressing the problem directly (in the post). But again, there are several situations that can arise, and I’ll try and address them in a future post. Just keep in mind that users can comment, and those comments might not always be positive. After reading this post, I hope you better understand the power of using unpublished posts along with custom audiences and lookalike audiences. Unfortunately, the features and functionality I covered in the post are not readily apparent to many Facebook advertisers. And that’s a shame, since they can be extremely effective for businesses looking to engage current customers and new audiences, while also increasing sales. I recommend testing this approach soon to see if it can be effective for your business.